It was hidden in plain sight if 100% objectively, accurate genuine historical facts were taken in consideration which were for 70 years suppressed, concealed, censored by the corporately corrupted mainstream media and by the equally self-suppressed, self-censored lobby funded establishment Republican and House and Senate politicians, and by a White House which was occupied by default, by a corrupt, dishonest, right-wing extremist, incoherent, incompetent, narcissist, national white supremacist, misogynist, who is dangerously belligerent, and lives in the lalaland of so-called, non-existent, “exceptionalism”. At no time from the date of the launching this ARGENTUM POST in 2013 to the present, has this writer seen fit to vilify Russia/USSR/Putin as there was simply no basis for it, no matter how one would read into the toxic propagandistic memes during the Russophobia pathogen dissemination started in 2016. Of course, as in every country, there are instances of corruption amongst particularly the oligarchs which have raided the public property after the collapse of the USSR, and most notably for that was the alcoholic misleader of Russia, Yeltsin. But this is not a motive for any generalization for post-USSR Russia. Although it was obvious to most academics, be they, historians, or investigative journalists, or senior professional, honorable diplomacy practicing, members of the U.S. foreign service, of the U.S. intelligence community, as well as their global equivalents, and as well as any citizen who has a heightened sense of social, humanist consciousness, that just as the criminally and obscenely fabricated grounds, for using and abusing the 9/11 tragedy, and of using the falsehood of WMD, to go war on Iraq, were the brazen lies propagated by the Russiaphobes after the exposure of the DNC attempt to undermine Bernie Sanders nomination. After falsely claiming that Iraq supported Al Qaeda and had WMD, neocons, AND neolibs, decided to invade and bomb the living daylights out of Afghanistan, Iraq, Libia, Syria and sponsor the criminal wars by Saudi Arabia on Yemen (started 4 years) ago where 17 thousand innocent men, women, and children are massacred by Yemen with U.S. support, and on Bahrain when its majority Shiite population rose up against its Sunni decadent dictatorship, and to boot the horrific decision (by Hillary Clinton and Obama) to not condemn the crashing of democracy in Honduras by a coup which Clinton insisted not be characterized as coup, which abducted its popular, progressive President Zelaya, because of our “interests” in our military base there which was used by the U.S. during the dirty wars in Central America (in support of fascist regimes in El Salvador, Nicaragua, and Guatemala) led by Nixon, Reagan, and senior Bush, were additional equivalent lies for such gruesome and violent interventionism which becames self-defeating as a result of the hemorrhage of our treasury and of innocent human lives, wastefully. Incidentally, this regime of fascist thugs who violently abducted the very popular, progressive President Zelaya of Honduras which to this day is now falling apart and committing crimes against its own people, hence the Honduran caravans to the border, has its most of its refugees barred at the border for entry, but it has moved Trump to engage in the international law and UN Rules violating move of requesting the Honduran thuggish coup perpetrators to move their embassy to Jerusalem. Finally, last but by all means not least, is the more than 70 -year outrageous brazen and undercover support for the ethnic cleansing by the Israeli entity implanted in Palestine by might makes right tactics in cooperation with the British empire in 1948, which has led to nothing but the most draconian meting out of national and international law-violating sanctions, massacres, targeted assassinations, house demolitions, and collective punishments against its autochthonous Palestinian inhabitants for centuries. So the foregoing historically accurate events which the media, as well as our educational institutions, are methodically suppressing, concealing, gagging federal government officials from even discussing, lie at the root of the torturous life imposed on Palestinians in their homeland, and it is these barbaric atrocities which underly preponderantly the anger against the U.S. abroad. Since the 2016 campaign, it became crystal clear that Trump along with his son in law, Jared Kushner, goaded on now by greed and by such mummified right-wing extremist evangelical fundamentalist Zionist extremists such as VP Pence, by John Bolton, and the formerly convicted Elliot Abrams, and Mike Pompeo as well, would and did, double down on establishing liaisons with the most repressive regimes in the world today, namely that of Saudi Arabia and that of Israel’s now nation-state of not of all of its inhabitants, namely Benjamin Netanyahu who is now bombing the living daylights out of Gaza again, just prior to the April 9th election and probably prior to his indictment for corruptions crimes as stated by the Attorney General of Israel. Trump has had the audacity to offer the murderous, terrorist misleader of Saudi Arabia, for petro-dollars of course, armaments which Bin Salman uses in his hegemonic destruction of Yemen, and to boot, incredibly and idiotically to ad injury to insult, this member of the House of Saud (which practices the most extremist form of Islam which is in effect way beyond the realm of normal, moderate Islam, namely the movement characterized by Wahhabism and Salafiyya which inspired Al Qaeda and the Islamic State). He offered recently to sell nuclear technology secrets which could assist in weaponizing nuclear energy, just as Israel sold and help install nuclear weaponization technology to the odious, white supremacist regime of Apartheid South Africa in the mid ’80s. So at this point it becomes evident to all of us who have studied real history and who immediately after the DNC’s scandalous behaviour by Debbie Wasserman Schulz, Hillary Clinton and other neolib operatives were exposed as devising a tactic to fatally undermine the nomination of Bernie Sanders by discussing the possibility of leaking to the press that Bernie Sanders is not “Jewish enough“, or worse, that he is a not a practitioner of the religion, when in reality he would have been a formidably strong opponent of Trump to the point that we would have been able to elect him, Electoral College shenanigans notwithstanding. As it turned out though, for the second time in recent years, the presidential candidate who did not win the election by the REAL democratic vote standard, i.e. one vote-one man/woman, won it! Yes, Trump lost by democratic standards adopted in the majority of the world’s countries. Hillary Clinton won the election by almost 3 million votes. When then Hillary Clinton then unbelievably decided to play dishonestly the blame game and thereby initiated the repulsive campaign of vilification on steroids against Putin, against Russia, in coordination with the British government, most particularly that of Teresa May, the toxic pathogens spread wildly and the Rachel Maddows of the media went on reckless rampages of hit and run hysterical proclamations of guilt by Putin without any proof. It is very sad the Democratic establishment party has sunk so low. Our only hope now is based on the initiatives of the new progressive Democrats, and of Trump’s own demerits. Had the Mueller probe investigated the contacts and collusions between Trump and Kushner and Netanyahu in ways that led Trump to engage in outrageous acts of national and international law violations which go on to this day, then it would have taken Mueller a fraction of the time he spent in his 2-year wild goose chase to come up with evidence of high crimes which could have him removed from the seat of power he does not deserve, does not honor, and thereby endangers our national security from. The silver lining is that if “we the people ” now move on, and insist in an end to the grotesque lies, such as that Russia “invaded” or “annexed” Crimea, when everyone who can read and has a basic knowledge of the history of the USSR / Russia knows that Crimea is 87% Russian, has been an integral part of Russia now for more than 300 years, and voted overwhelmingly to stay within the Russian Federation. We have an imperative to now rebuild our relationship with Russia, and engage with Russia constructively to finally inspire the world to abide by Article VI of the NPT (non-proliferation treaty of nuclear weapons) and that means that we, along with the rest of the world, now start to expeditiously to dismantle our nuclear arsenal of weapons down to zero levels so that our children, grandchildren, and more can look forward to a secure, reformed, people responsive future which must be characterized by non-interventionism and by peaceful conflict resolutions so that the obscene offensive defense budget which enriches the toxic industrial military complex can once and for all be eliminated, as former President Eisenhower kindly and humanistically advised us on his farewell speech. Yes, “we the people” can make America all it can be inspirationally again. With this foreword, this writer of the ARGENTUM POST cuts to the chase of the objective of this article which is to very succinctly invite its readers to become aware of a vibrant yearly conference which takes place on a yearly basis at the Washington, DC’s National Press Club. Not once, was this enormously important conference in such a prestigious institution as the National Press Club, covered by The Washington Post of the New York Times. This is what censorship looks like. What does get covered is the almost annual conference of the Israel propaganda lobby AIPAC which has failed to register for the FARA (Foreign Agent Registration Act), and which is getting desperate as a result of losing its younger American Jewish support as it is losing traction by, inter alia, smearing hysterically the reputations of those who reject “anti-Semitism” but obviously and naturally express their indignations with the crimes against the humanity of the Palestinians. This most recent conference hysterically bashed the young new progressive member of the House of Representatives, namely Ilahn Omar Representative from Minnesota, brazenly and falsely accusing her of being “anti-Semitic”. These kinds of epithets, as well as aggressive actions by extremist right-wing nationalist supremacist Zionists Jews in effect, are extremely self-defeating as it renders literally such Jews “anti-Semites”. This writer has attended this conference since 2014 (one year after launching this ARGENTUM POST). This conference is typically attended by some 400- 500 progressive outlook intellectuals, as well as students endowed with intellectual curiosity and it, lasts 8 hours long, featuring typically some 10-15 or more speakers from all over the world. It is attended by people of a wide variety of backgrounds, such as literary peace by justice activists as this writer is via the ARGENTUM POST, by lawyers, journalists, intelligence and law enforcement communities of the U.S. and abroad, members of the American foreign service, including ambassadors, and many many others. Rather than providing my readers of notes from this writer’s copious annotations during the conference, this writer provides you with a link to the entire conference which was covered by the fabulous, non-tendentious Cable-Satellite Public Affairs Network (CSPAN). This is the link to the whole conference which is announced infra. BTW, The Susan Abulhawa presentation infra was one of the most substantively loaded with documentation as regards to the provision of armaments by the now Trump doubled down supported regime of Benjamin Netanyahu, to most of the world’s oppressive strong men regimes in Africa, South America, and elsewhere. 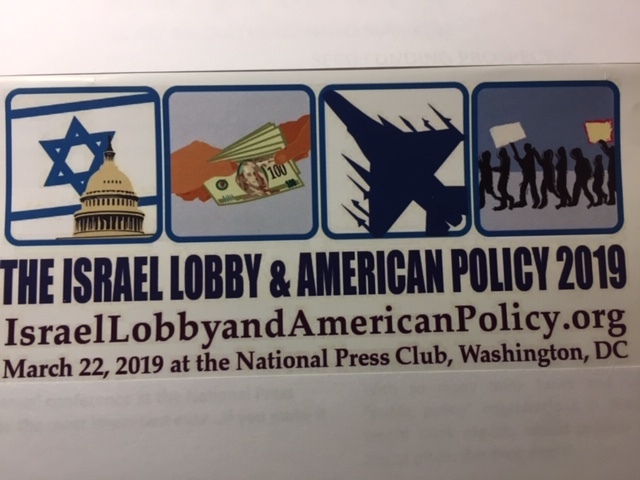 The cost of Israel support for these nefarious illegal activities is $ 10 million dollars per day from our taxpayers’ funds, at a time when Trump envisions major cuts to Medicare, to education, to funds for Puerto Rico reconstruction and more.